It is well-recognized that as the fifth sense of taste, umami amplifies the flavor of savory foods, increasing the enjoyment and pleasure in eating. It also enhances appetite — the feeling of wanting to eat food as explained in the definition above. Interestingly enough, research has shown that the umami flavor can also heighten satiety — the satisfaction of being full. Twenty-six volunteers were divided into two groups. One group consumed low-calorie carrot soup both with and without the addition of an MSG-IMP combination. The other group consumed a high-calorie, high-carbohydrate, high-protein carrot soup both with and without the addition of an MSG-IMP combination. Participants were asked to rate how filling, pleasant, salty, savory, strong, and sweet the sample soups were, as well as rating appetite by how full, hungry, and thirsty they felt after soup consumption. Forty-five minutes after soup intake, participants were provided a test meal of pasta and sauce, and told to “Please eat as much pasta as you like until you feel comfortably full.” They were tracked on how much they ate, as well as questioned about their appetite and how full they felt. It should be no surprise that the umami–enriched soups were deemed more palatable and flavorful. This increased appetite in the short‐term but also very quickly increased satiety. The participants who ate the umami taste-enhanced soups consumed less of their subsequent meal which consequently reduced overall calorie consumption, regardless of the amount of calories in the soup. Significantly, they still said they felt satisfied. Umami, the flavor that gives food its “deliciousness” has a promising role in regulating appetite and, indeed, providing feelings of satiety. 1. Masic, U and Yeomans, M. Umami flavor enhances appetite but also increases satiety. AJCN. 2014. 100 (2): 532–538. https://academic.oup.com/ajcn/article/100/2/532/4576469. Want proof of how yummy and satisfying umami-rich soup can be? Here is my adaptation of the French vegetable soup Soupe au Pistou, adapted from the Time-Life Book Foods of the World: The Cooking of Provincial France. Not having fresh basil on hand I was skipping the Pistou part of it. Despite the flavorful ingredients, the soup did not have the depth of savoriness I wanted. 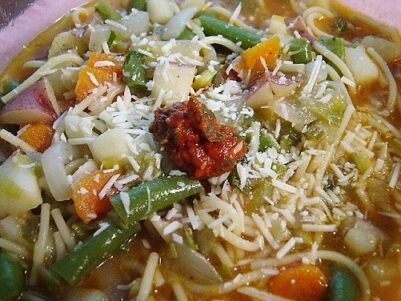 The umami taste-boost can be added in several ways, for instance using a chicken-based stock, or sprinkling Parmesan cheese on top or choosing to make the Pistou. I chose to add a teaspoon of MSG, and voila, deliciousness! Heat oil in a 6-qt. saucepan over medium-high heat. Add onions, reduce heat to medium; cook until limp and golden. Add tomatoes and heat 3-4 minutes. Add water and tomatoes, and bring to a boil. Add carrots, potatoes, celery, and pepper. Reduce heat and simmer 15 minutes. Stir in white beans, green beans, zucchini, and spaghetti. Simmer another 15 minutes until vegetables are tender and spaghetti al dente, about 8 minutes. Season with salt and pepper and MSG. Process garlic, basil, oil, salt, garlic, tomato paste, and Parmesan, in a food processor until finely ground. Previous PostScientists Have Known MSG Is Safe for Decades. Why Don’t Most Americans?